EVERY SUMMER, THERE is a frenzied panic as students try and secure accommodation for their college year ahead. With rents soaring and a lack of housing stock on the market, students are under significant pressure to find suitable places to rent. 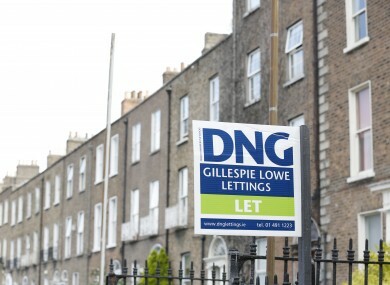 As part of the government’s action plan to deal with the ongoing housing crisis, Ministers for Housing Simon Coveney and Damien English have put forward funding to hire a dedicated student housing officer. An allocation of €49,000 has been given to the Union of Students of Ireland (USI) to hire the new officer. Their role will be to help identify additional accommodation, including digs and rooms in private homes in order to ease the pressure on securing rented accommodation ahead of the next academic year. The government’s action plan found Ireland’s third-level student population is projected to grow by around 20,000 students (about 15%) to 193,000 students by 2024. It also cited 2015 student accommodation report by the Higher Education Authority (HEA) which estimated an existing level of unmet demand of about 25,000 student bed spaces nationally. While Minister Coveney has said new student accommodation projects are on the way, with some 300 new on-campus places in Maynooth University and 350 units in UCD, units are needed now. Minister Coveney said the new appointment is an immediate response to the crisis. The new student housing officer will work with the USI, local authorities, approved housing bodies and housing providers to identify and expand short-term student accommodation units. The officer will also assist students to find appropriate accommodation and will be employed for a period of nine months. Additional funding has also been granted to the USI on a once-off basis to support the digs service it runs, which last year helped 600 students to find suitable housing. The USI aims to increase the number of students finding housing through the digs service to 1,000 this year. Minister Coveney said he believed the USI has great potential to identify new accommodation not currently available for rent by students. This new funding support from my department will allow the union to reach that potential in supporting the student accommodation sector, and providing greater choice for both new and existing third-level students. Minister English the government has “moved quickly” to put this new resource in place. This is an indication of our intent regarding early implementation of the actions under this plan. The activities planned for the new student housing project manager, working with the USI, will bring benefits to the important area of student accommodation and all of these individual actions under the action plan, if tackled progressively, will bring us to an overall better housing situation nationally. He said the additional funding will allow work to begin right away ahead of the urgent demand that will follow the CAO offers this August. The announcement comes in the wake of Trinity College Dublin being denied planning permission to build new student accommodation on Pearse Street. Email “It's a nightmare to find students digs, so the government is hiring someone to help ”. Feedback on “It's a nightmare to find students digs, so the government is hiring someone to help ”.